As a rule, people’s earnings rise along with their literacy, alth0ugh the degree to which that’s true varies considerably from country to country. And what’s true for individuals also holds for countries, according to a new study from the Organization for Economic Cooperation and Development: Countries where a large proportion of the workforce is employed in jobs requiring greater use of reading skills tend to be more economically productive. The OECD, a grouping of 34 developed countries, tested 166,000 adults in 24 countries as part of its new Survey of Adult Skills; people were asked to, among other things, read and interpret articles, job postings and other texts; analyze graphs and charts; and navigate websites to accomplish a given task. The first results, released earlier this week, showed the U.S. ranking below average on both the literacy and numeracy measures (the problem-solving scale wasn’t immediately available). 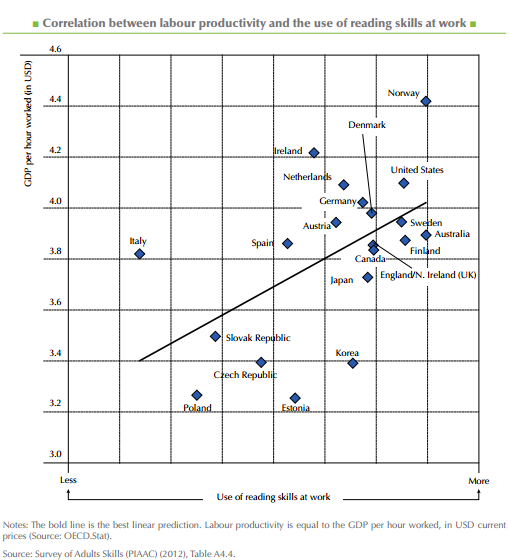 In an increasingly technologized, interlinked global economy, where more and more jobs involve analyzing and communicating information, the correlation between productivity (defined as output per hour worked) and use of reading skills at work may come as no surprise. But it has major developmental implications, the OECD noted, especially for countries that aren’t effectively deploying what skills their residents have. For instance, Japan ranked highest in both literacy and numeracy, but more than 20% of Japanese adults at the highest proficiency levels aren’t even in the workforce. In Norway, by contrast, only 9% of the most-proficient adults are out of the labor force. Italy has a double-barreled problem: Less than 5% of Italy’s workforce is at the highest levels of literacy proficiency, and yet close to one in four of that elite group is out of the labor force entirely; another 5% are unemployed. The OECD’s adult-skills study is ongoing. A second round, covering nine more countries, began last year, though results aren’t scheduled to be published until 2016. A third round is set to launch in May 2014.